Arup has just launched a scaffolding system fitted with a green living wall to make building sites healthier and more attractive for local communities. ARUP’S new system is being piloted on a Grade I listed Mayfair building project in London with developer Grosvenor. 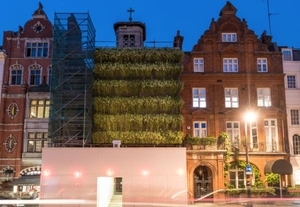 The temporary wall, named ‘Living Wall Lite’, has been designed by Arup and manufactured by Swedish living wall specialist Green Fortune, and is fitted with sensors to monitor its impact on noise, temperature and air pollution. It is hoped the temporary living wall scaffolding being used on the St Mark’s building project will reduce localised air pollution by up to 20% and dampen noise pollution by up to 10 decibels. Mark Tredwell, development director of Grosvenor’s London estate, said: “This is a great initiative and is in line with our long-term ambition to improve the environmental sustainability of the buildings across our London estate, reducing emissions by 50% by 2030.